As artificial intelligence and robotic systems become more prevalent, it’s increasingly important that they work well with others — especially humans. Computer science graduate student Tathagata Chakraborti is working to address the challenges of human-AI collaborative planning, or “human-in-the-loop planning.” Working together requires AI systems to be able to model human intentions and plan their actions with those intentions in mind. So Chakraborti is studying how planners model collaborative behavior and the role of planners as decision support. Chakraborti works in Professor Subbarao Kambhampati’s Yochan Lab where he and other computer science students test their planning algorithms (“Yochan” is the Sanskrit word for “plan”) for human-robot collaboration with several robots: “Kramer,” a one-armed, mobile industrial robot; “Newman,” a two-armed industrial robot with a programmable display “face”; “Sprinkles,” a mobile robot designed up help with office tasks through speech recognition that can also recognize faces; and the “Clone Troopers,” a fleet of small humanoid robots used for various projects. The robots were procured with the help of Defense University Research Instrumentation Program (DURIP) grants from the Office of Naval Research and the Army Research Office. His research efforts earned Chakraborti an IBM PhD Fellowship award — a competitive, worldwide program that honors exceptional doctoral students pursuing innovations in computing technology and striving to solve problems that align with IBM’s research goals. “This is a great opportunity to work on my ideas with people who share the same vision of the future of AI — that AI and humans together can do better than the sum of individuals,” Chakraborti says. Part of the Fellowship involves working with an IBM mentor. For Chakraborti this is Kartik Talamadupula, a research staff member at IBM who is also an alumnus of the Yochan Lab. Talamadupula’s research, conducted at IBM’s T.J. Watson Research Center, investigates the role of automated planning in guiding dialogue between intelligent machines and end users. Chakraborti and Talamadupula have similar research interests and they’ve worked together before on co-authored conference and workshop papers, but it’ll be Chakraborti’s first time working with Talamadupula and IBM directly on-site. IBM also encourages its PhD Fellows to participate in an internship, which Chakraborti plans to do starting in May at IBM’s Cognitive Algorithms Department, where he’ll join the AI and Optimization group and work on symbiotic human-AI systems. The award includes a $20,000 stipend for the 2016-2017 academic year and a $10,000 education allowance. “It’s always great to have some extra funds — it lets you be more creative with your ideas and more ambitious in trying them out,” Chakraborti says. Overall, he sees the award as honoring his past work and providing opportunities for his future. Kambhampati nominated Chakraborti, whom he calls a “star” student and “good citizen” of the department, for the award. IBM PhD Fellows are selected based on their “overall potential for research excellence” as well as demonstrated progress through publications, criteria Chakraborti meets with ease. “He came with an unusually impressive publication record right out of his undergraduate study and has continued to build on that,” Kambhampati says. Since entering the computer science doctoral program in 2013, Chakraborti has already presented his work in several international forums, published papers as part of international conferences and peer-reviewed workshops, and collaborated with NASA and other research centers and universities. He has also earned two University Graduate Fellowship Awards from the School of Computing, Informatics, and Decision Systems Engineering as recognition for his work. 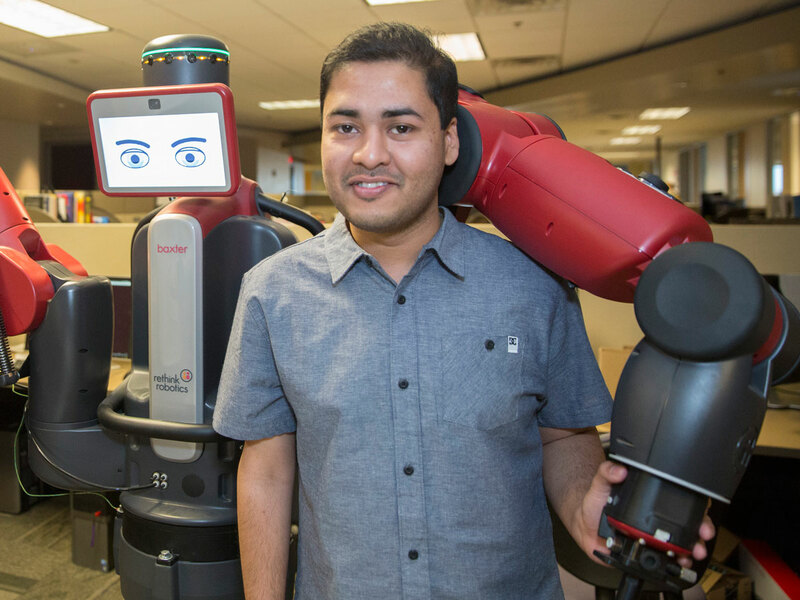 “His dissertation will enable better symbiotic workspaces between humans and robots and provide pathways to augment human intelligence for effective synergy,” Kambhampati says. “He is a great sounding board and I consider him more a post-doctoral colleague than a graduate student,” Kambhampati says. After their fellowship period, doctoral students have the opportunity to be nominated for another IBM PhD Fellowship award. Chakraborti is still getting ready to start his work with IBM, but he says he would be happy to do more with them later in his academic career at ASU. The next stage in his research at ASU is to work on the human side of the AI-human team by validating theoretical results on biological data like electroencephalogram (EEG) tests to establish psychological or neuroscientific connections to how humans respond to robotic teammates. “This is vital in order for AI algorithms to move from the drawing board to actual integration with human workflows,” Chakraborti says. “I believe that my research will contribute significantly to the progress of standalone automated planners toward addressing the requirements of the human component, and provide much needed guidance for principled and well-informed design of intelligent symbiotic systems of the future. Chakraborti says he isn’t sure what he’ll do after he earns his PhD, which he expects to in 2018, but he says he does know he wants to pursue his love of research either in academia or industry, and maybe even at IBM. ASU nutrition students came up with cricket-centric menu for capstone project. Public is welcome at ASU Kitchen Cafe. It's what you might hear when you offer an insect entree, but it's also what will be on the menu April 12 at the ASU Kitchen Cafe on the Downtown Phoenix campus. Customers on that day won’t be eating plates of whole crickets. Instead, they’ll have a choice if they want a powder containing the remnants of the insect sprinkled on their meal — or not. “They’ll be ground up so it doesn’t look like you’re eating them … but it’s still a cricket,” said Heidi Lynch with a laugh. Lynch is a registered dietitian who teaches Management of Food Service Systems (NTR 445), a lab for students in the School of Nutrition and Health PromotionThe School of Nutrition and Health Promotion is part of the College of Health Solutions. who are majoring in either dietetics or food service management. For their capstone project, students were assigned to groups of four and came up with their own theme and recipes for their production day next week, when their menu would be on offer for a day. The groups have prepared menus that promote healthy eating, focusing specifically on antioxidants, diabetes, digestion, heart and energy. One team — Anna Gianpetro, Rachel Pfeifer, Melissa Galloway and Jared Blake — prepared a menu that promoted brain concentration. They came up with a clever low-calorie, high-protein menu of a Neuro-Nut Burger, Perceptive Pesto Penne, Mind-Muffin and Focusing Fruit Salad. But how did Gianpetro come of with the idea of adding cricket powder to the first two menu items? Crickets also fit the bill nutritionally speaking. They are considered a sustainable and environmentally sound protein, loaded with potassium, calcium, iron, vitamin B and brain-building omega-3 fatty acids, monounsaturated fats and antioxidants. Beyond all the nutritional and health benefits of crickets, it’s also a good idea to give natural protein such as beef a break, said Pfiefer, a 28-year-old dietetics and nutrition senior who will graduate in December. The problem, of course, is that many Westerners consider eating insects disgusting. But according to Gianpetro, it’s as tasty as the dickens. ASU nutrition/dietetics students Rachel Pfeifer and Jared Blake peel onions at the ASU Kitchen Cafe on April 5. NTR 445: Management of Food Service Systems is a lab for students in the School of Nutrition and Health Promotion who are majoring in either dietetics or food service management, and the goals are learning to manage production schedules, food safety, purchase orders and menus. Gianpetro hopes cricket protein powder will catch on with foodies in the States. It has has been used in such items as protein bars, milkshakes and brownie mix. But even she readily admits she can only stomach the critters if they’re dead and have gone through the milling process. “They’re cute, but I don’t like the idea of them jumping around my legs,” Gianpetro said, laughing. What: “Foods for Concentration” special menu featuring two items with optional cricket powder at the ASU Kitchen Cafe, which is open to the public. When: 11:40 a.m.-12:50 p.m. Tuesday, April 12. Where: ASU Kitchen Cafe, on the ground floor of the Health South Building, 500 N. 3rd St. on the Downtown Phoenix campus. Cost: Two menu items will have the cricket option: Neuro-Nut Burgers (walnuts, oats, lettuce, tomato, avocado, whole-wheat bun) are $4 each, and Perceptive Pesto Penne (whole-wheat penne, pesto, zucchini, cherry tomatoes and mozzarella) is $6. Other menu items range from $1 to $3.50.